A Girl with a Realm to Save. Kenji Kamiyama (Ghost in the Shell: Stand Alone Complex, Eden of the East) brings us the beautiful tale of Kokone Morikawa, a young schoolgirl who is prone to falling asleep in class or anywhere else really. It is where she goes while she is asleep that takes us on a flight of fantasy. Napping Princess is great family fun. The kingdom of Heartland is a futuristic land that is obsessed with cars and every subject works at the car plant for twelve hours and they are docked pay for being late or for owning an out of date vehicle. The huge building also serves as the King’s palace where he lives with his daughter Ancien who has the ability to bring objects to life using her tablet. The King gives Ancien a stuffed toy and which she names Joy and she also uses her tablet to bring Joy to life. The King disapproves of his daughters power and confiscates her tablet and the other things she has brought to life (a motorbike). This kingdom has its problems as well in the form of the ‘Colossus’ which is a giant molten monster that is constantly attacking the city and also there are plots against the king from within the palace. There is one man on a mission to stop the colossus along with the Kings massive robots,. He is the rebellious Peach who rides an old motorbike and constantly has his wages docked for it. Ancien decides to align herself with this biker-jacket wearing vigilante. In Japan just before the 2020 Olympics, Kokone is just about to finish the last semester of school but rather than studying as she should be, she spends her time drifting off and finding herself in the realms of Heartland and the young Ancien is a younger version of herself. She wants to go to college in Tokyo just like her friend Morio who she bumps into on his summer vacation at a bus stop. Kokone lives with her eccentric engineer/mechanic father Momotarō, who three days before the Olympics is arrested for stealing Shijima Motors secrets. The authorities want to retrieve a tablet that looks very much like Ancien’s even down to the cracked screen and it is hidden inside a blue stuffed bear. Kokone and Morio get together with her fathers motorbike and head to save him. There are things afoot in both worlds and Ancien and Kokone and her friends are the only ones who can save the day. 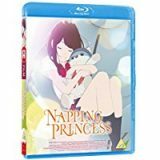 Napping Princess is fun for all the family, a great way to spend a hundred and ten minutes of your day time and time again, and watch all the way to the end of the credits.